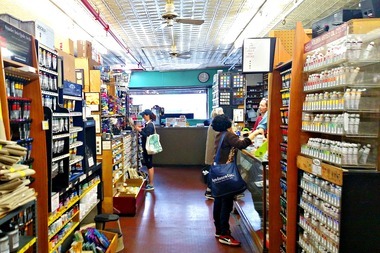 New York Central Art Supply, which has sold art supplies at 62 Third Ave. since 1905, will close within the coming months. EAST VILLAGE — A 111-year-old art supply store will shutter for good by the end of the summer as its beloved Third Avenue storefront — once patronized by such artists as Andy Warhol and Willem de Kooning — changes ownership, the owners announced on Monday. New York Central Art Supply will vacate the 62 Third Ave. storefront by the end of September, according Doug Steinberg, whose family has owned the shop since its launch in 1905 — and while the sale of the building has been the impetus for the closure, he said, the business has for years been struggling to stay afloat as the way artists shop for supplies has changed significantly. "The building being sold just puts a hard date on what was an inevitability — even if the building wasn't being sold, the business was still not healthy enough to survive," he said. "People shop online, people shop at chain stores — we're just seeing the volume of traffic that comes into the store way down from what it used to be." The shop last year hosted a “warehouse sale” in preparation for restructuring the business to compete with such art supply giants as Blick Art Materials, Steinberg said at the time, dispelling rumors the shop would be closing. The store must be vacated by the end of September, said Steinberg, and it will hold on for as long as the remaining inventory holds out. Until the closure, shoppers can stock up on art supplies on the cheap, with 20 to 50-percent discounts storewide, said Steinberg. Steinberg first announced the closure on Monday in a letter posted to the shop's website. Meanwhile, the owners will be “entertaining any offers to acquire our inventory and intellectual property,” according to the letter — and Steinberg confirmed it is unlikely there will be another incarnation of the supply shop, noting renting would be too expensive and it would be difficult to keep enough merchandise to run an online store. "There really are no alternatives," he said.